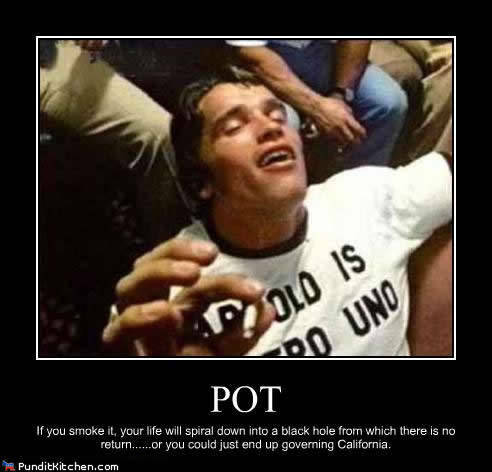 Although California has not yet legalized in California through Proposition 19, Governor Schwarzenegger signed a new law reclassifying possession of an ounce or less as an infraction. Possession is equivalent to a parking ticket. In many ways this new law doesn’t change much. Almost no one in California gets arrested for small amounts of marijuana anyway and if Proposition 19 passes fully legalizing marijuana the same people will still smoke it. Marijuana has been virtually legal in California for years. What will change is that we will no longer be wasting state resources fighting a fake war on drugs. Rather than wasting tax money marijuana will be generating tax money. And since marijuana is safer than alcohol many people will use it instead of getting drunk which will actually lead to a safer society. And if California legalizes it the rest of the nation will soon follow. I’m hoping people all over America will support California in it’s fight to pass Prop 19 so that we can use law enforcement resources to prevent addiction to real drugs like meth, cocaine, heroine, and cigarettes.